Visit Oia, a pretty village of pastel-tinted houses set into the cliffside of Santorini’s highest peak. Look for paths in the village that will guide you to one of the two black-sand volcanic beaches. Extremely crowded, cruise description was not even close to what was described. way too rushed for us but enjoyed the day. Incredible how easy this lifestyle is to get used to. Incredible how easy this lifestyle is to get used to. Perfect scenery and it doesn&apos;t get any better than seeing the views here. WAAAAY to crowded - made it a little unbearable. 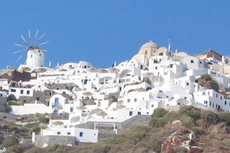 Bus met us to the south of the island (tender port) and drove to Oia in the north. Needed more time there but transport too bad and caused delays. Beautiful from start to finish everything we expected and more. Beautiful from start to finish everything we expected and more. A very good guide. We did Oia on Your Own, and it was probably the best way to see it. Saw the ruins at Akrotiri and pretty much toured the island by bus getting to the ruins site. We did the Oia Village with stop at winery and then finishing at cable car town. We did the Oia Village with stop at winery and then finishing at cable car town. It was awesome and had we had a great time on this tour. I highly reccommend it. Our tour guide told some of us to be back for 0930 and others for 1030 then disappeared! Our tour guide told some of us to be back for 0930 and others for 1030 then disappeared! Too many people in small village where shops not even open yet! It is very picturesque. Oia and Fira were excellent - so was the tour guide. Oia and Fira were excellent - so was the tour guide. However what was stressful and spoilt the excursion were the horrendous queues to use the cable car to get back to the tender. Costa had advised us not to walk down. Great guide, one of the most beautiful places on earth. Great guide, one of the most beautiful places on earth. Glad for tour, the crowds would have made visit very stressful. This was by far our favorite island. We visited Akrotiri, which was interesting but the guide took too long. Amazing how much we could see in such a short time. We love Oia and Fira. We love Oia and Fira. We had been there before. A lovely experience on a beautiful island. Again, walking is a challenge for anyone with walking difficulties.